Maduro, without any sign of injury, delivered a televised address about two hours after his public speech at a military event was interrupted by loud explosions. Venezuelan officials said explosive drones were detonated near the president in a failed assassination attempt. An investigation into the incident has been launched and some of the suspected perpetrators apprehended, according to Maduro. The president accused far-right opposition and external actors. "I have no doubt that everything points to the Venezuelan ultra-right in alliance with the Colombian extreme right, and the name of [Colombian President] Juan Manuel Santos is behind this attack," he said. Relations have been tense between Caracas and Bogota in recent years, with the Venezuelan leader earlier describing Colombia as “lackey" of the US. Colombia’s Santos did say in an in interview with AFP this week that the days of Maduro in charge of Venezuela were numbered. “If you put the two together, you get a drone attack against the President of Venezuela,” Dr. Francisco Dominguez, a senior lecturer at Middlesex University, said. President Maduro also claimed that the first results of the investigation of the attack showed that several of those, who paid for the attack reside in Florida, US. All the attempts to topple the authorities in Caracas “started in Colombia, but were also organized and orchestrated by the elements in the US… in the exiled Cuban community in Miami,” Dominguez said. “Obviously, they haven’t been able to produce that coup d'etat and one gets a strong impression that they’re getting a bit desperate,” the academic said, referring to the attempt on Maduro’s life. The drone assassination attempt on Maduro “took, at least, half a year to prepare,” Jorge Rodriguez, Venezuela’s information minister, told RIA-Novosti, adding that the perpetrators, who were detained shortly after the attack, have been sharing details of the operation with investigators. 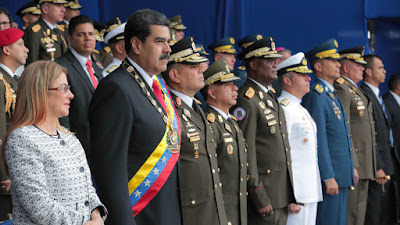 Six people were detained in connection to the drone attack, targeting the Venezuelan leader, Interior Ministert, Nestor Reverol, told Telesur broadcaster. Two drones, each equipped with a kilogram of C-4 explosives, were used by the perpetrators in the assassination attempt, Reverol added. Colombia’s ministry of foreign affairs has rejected the allegations it has anything to do with the reported assault. Venezuela's economy is in dire straits, with hyperinflation heading for a dismal 1,000,000 percent by end of year. The US has been pressuring the country with sanctions and leveraging its allies to do the same, claiming Maduro is a dictator who came to power illegitimately and is starving his people. US President Donald Trump has openly considered a military option against Venezuela, and calls for a coup have made it to the headlines of US mainstream media.